I am new to QuickFile and I am trying to create a custom style for my invoices. 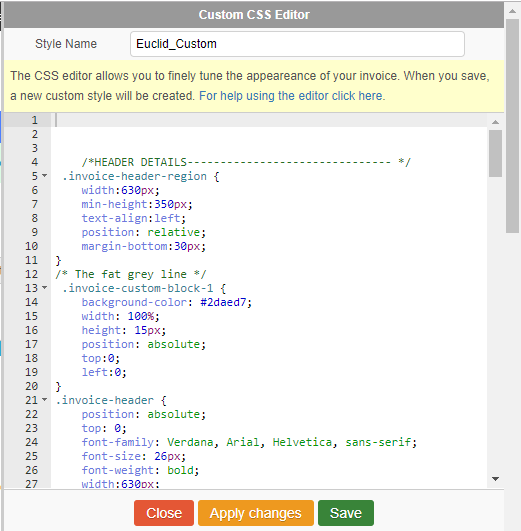 When I bring up the Custom CSS Editor it is very limited, it gives no logo adjustment details and has much less functionality than the page markup box that I can also bring up. In the page markup box it feels like I can achieve everything I want, but the changes aren’t saved. Can someone please give me a little advice on where I might be going wrong. 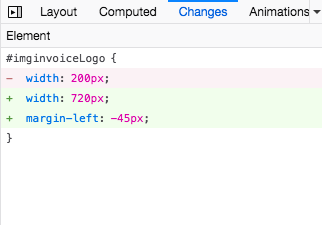 Can I just confirm, this is the box you’re seeing and editing the CSS in? Is there anything in particular you’re looking to edit? Perhaps we can point you in the right direction? Thanks for getting back to me. There are a few things I’m trying to change currently (unfortunately I have no experience of CSS). @CPCP - Let me send you a private message and we’ll take a look for you. Keep an eye out for a green notification in the top right corner.